The celebration of the Sacrament of Reconciliation is an important movement in the life of the Christian family. 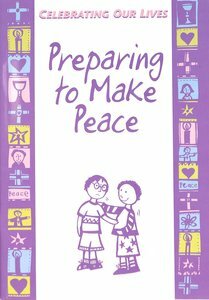 Preparing to Make Peace is a work book for children who are preparing for the Sacrament of Reconciliation. The units in Preparing to Make Peace explore the following themes: My family; Me and God; The family of the Church; Making peace in the family of the Church: My family and other families. This book has been prepared by a team of people with a special interest and skill in working with children in Sacramental preparation. Other books in this series include Preparing to Celebrate (Eucharist) Growing with the Spirit (pre-Eucharist Confirmation) and Preparing to Receive the Spirit (post-Eucharist Confirmation). About "Preparing to Make Peace (Celebrating Our Lives Series)"
Michael Trainor is a Catholic priest of the Archdiocese of Adelaide who teaches Bible at the Adelaide College of Divinity, which is the School of Theology of Flinders University, South Australia. Michael is a member of the pastoral team in the parish of Salisbury, and has published widely on the Bible and religious education.